Tied at 1 game apiece in the best-of-five National League Division Series, the Phillies and Cardinals will battle it out in St. Louis for a chance to go to advance. With lefty Cole Hamels on the mound, set to tie Hall of Famer Steve Carlton for most postseason starts by a pitcher in Phillies history, with 13, the Phillies will face another left-hander, Jaime Garcia in game 3 on Tuesday night. Read ahead for details on the pitching match ups and other key notes from these two games. Tuesday, 5:07 PM. Cole Hamels (14-9, 2.79 ERA) vs Jaime Garcia (13-7, 3.56 ERA). In 17 road games this season, Hamels posted a 7-3, 2.93 ERA with a .219 batting average against. Hamels has a 2-3 record with a 3.27 ERA in 9 career starts against the Cardinals. Albert Pujols is 4-for-23 (.174 avg) with a double and 2 HR in his career against Hamels. 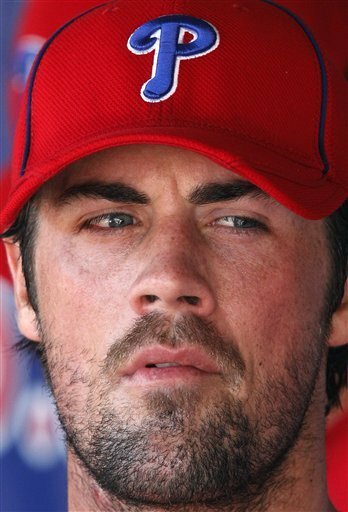 The 2008 World Series MVP, Hamels, has a 6-4 record with a 3.33 ERA in 12 career postseason starts. Garcia posted a 3-0 record with a 2.64 ERA in his final 5 starts of the regular season. In 6 career games against the Phillies, Garcia has a 2-1 record with a 1.20 ERA and a .178 batting average againts. In 15 home starts this year, Garcia posted a 9-4 record with a 2.55 ERA. Jimmy Rollins is 1-for-11 (.091 avg) in his career against Garcia. Wednesday, 6:07 PM. Roy Oswalt (9-10, 3.69 ERA) vs. Edwin Jackson (12-9, 3.79 ERA). In 33 career games against St. Louis, including the postseason, Oswalt has a 10-9 record and a 3.33 ERA. Oswalt posted a 5-4 record and a 3.59 ERA in 10 starts after the All-Star break this season. In 13 games for St. Louis this year, Jackson went 5-2 with a 3.58 ERA and a .300 batting average against. Jackson allowed 1 earned run in 2 innings of work against the Phillies in the 2008 World Series. Two-time All-Star Shane Victorino is a .268 hitter in 43 career postseason games. Victorino's 30 postseason RBI are second only to Ryan Howard's 33 on the all-time Phillies leader list. In 52 career games, including the postseason, against the Cardinals, Chase Utley is a .329 hitter with 6 HR and 32 RBI. Utley batted .239 with a .675 OPS in 50 regular season road games this year. Hunter Pence has a .259 batting average and a .674 OPS in 36 career games at Busch Stadium. In 43 career postseason games, Rafael Furcal has a .246 batting average with 3 homeruns and 26 runs scored. Furcal's team has lost 8 of 10 postseason series he has participated in, including 2 against the Phillies with the Dodgers in 2008 and 2009. Matt Holliday after the All-Star break this season batted .263 with 8 homeruns, compared to .324/24 prior to the break. Holliday has been sidelined lately with tendinits in his right hand and is not expected to play on Tuesday. Holliday is a .259 hitter in 15 career postseason games. Righty reliever Jason Motte earned the save in game 2 against the Phillies on Sunday. In 38 home appearances this season, Motte posted a 4-0 record with 7 saves, 1 blown save, a 3.12 ERA and a .160 batting average against.